We're deep in the woods with Android N news, but that doesn't mean everything else has stopped. This is still Update Wednesday and there are apks to be investigated. Earlier this morning a new version of Google+ turned up and it has at least a couple of changes worth looking at. The post pinning feature is back after a long hiatus, and the Circle Streams feature might be getting a few improvements of its own. If you're just looking for the update, a link is at the bottom of the post. The one definite feature of this release is the return of 'Pin to profile' for non-collection, non-community posts. This might seem a little specific, but it's one of the more common requests over the last few months. 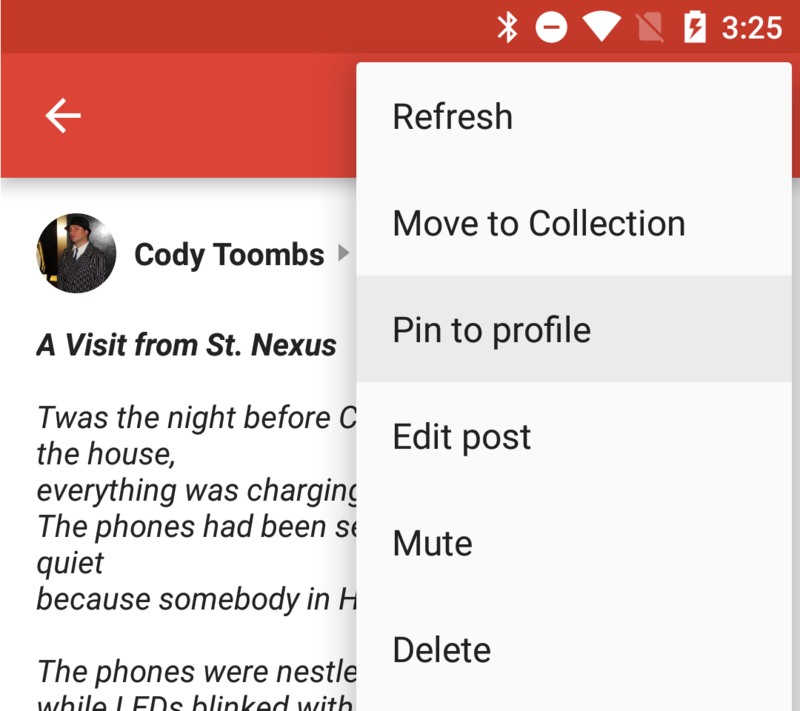 Pinning a post to the top of a profile was added to the web interface at the end of 2014, with the Android and iOS apps following along shortly after that. 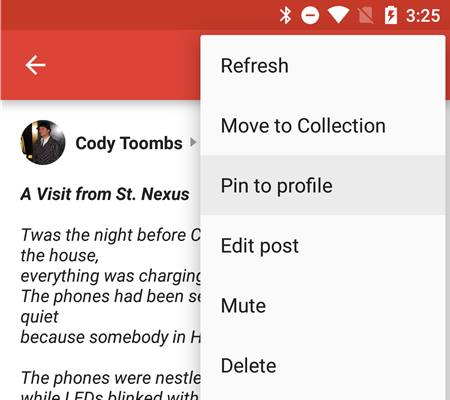 When Google+ was later (sorta) scrapped and rereleased in a lighter weight and generally less bloated "preview" version, many of the main features vanished, including the option to pin posts. A few weeks ago, pinning returned, but with the odd limitation that it only worked with in a community or a collection, but not purely generic posts. After that long explanation, it's a bit anti-climactic to say that pinning a profile post is possible again, but that's exactly what happened. In fact, this was fairly predictable after a couple of strings popped up last month in a teardown, which gave away the plans to bring it back. The command can be found If you open up a public post, and then hit the overflow menu to see the 'Pin to profile' option readily available. 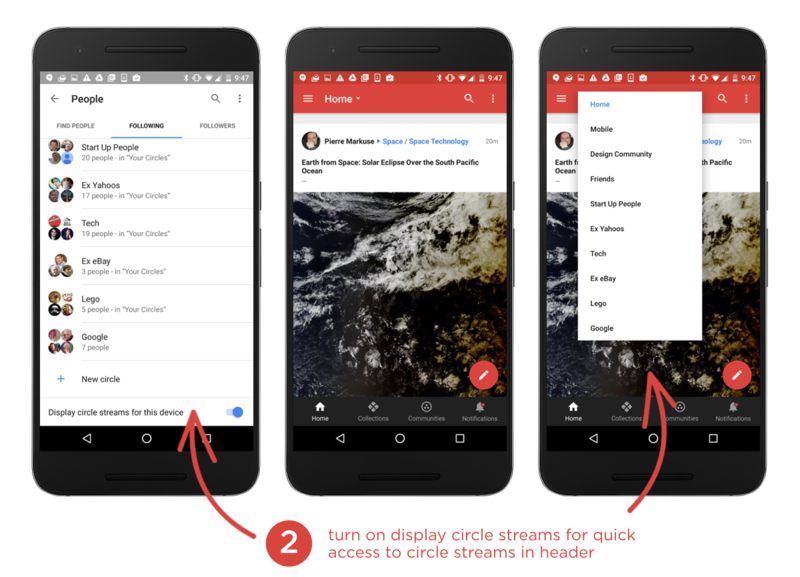 Googler Luke Wroblewski posted a changelog for this release and also mentioned some changes with the UI related to Circle Streams. Those are the specific feeds of content that come only from people in a specific circle. It seems the new version should have a new toggle at the bottom of the Followers list (in the People screen) and a dropdown option in the action bar for quickly switching between circles. I say 'should' because I can't see it, and judging by the comments, quite a few other users aren't seeing these changes either. Perhaps this is a server-side switch that's rolling out to a limited set of users over time, or maybe the wrong build of the apk was sent out, or this could even just be a glitch. Whatever the explanation, we'll probably see these particular changes turn up in the next couple of days, either through a new apk or just a silent update from the server. The option to enable or disable circle streams is already located in the Settings screen, so it's not hard to find, but this will make it more visible in a place where it logically belongs. However, the dropdown from the action bar is a nice alternative to pulling out the navigation drawer and looking through your list of circles on there.